The concise, convenient, and comprehensive handbook that fits in a lab coat pocket! The concise, convenient and comprehensive handbook that fits in a lab coat pocket! This edition covers the new pressure ulcer/injury definitions and position statements issued by the National Pressure Ulcer Advisory Panel. The section on acellular and cellular tissue products has been expanded to discuss the new products available and their indications for use. There is an expanded section on the use of negative pressure wound therapy emphasizing the instillation technique and the newest next-generation dressing. Information about new fistula management systems is included in this new edition. For more information, or pricing on bulk orders (i.e., more than 50 copies), please contact Jeremy Bowden at 800-237-7285 x 4219. 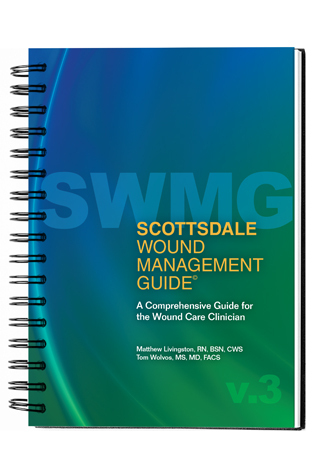 The Scottsdale Wound Management Guide: A Comprehensive Guide for the Wound Care Clinician by Matthew Livingston and Tom Wolvos is now in its third edition. The SWMG, available since 2009, continues to provide concise information for the newcomer to wound care as well as the seasoned veteran of wound management. It brings together valuable information for the wound practitioner that is rarely found in any other one place. “I feel that the third edition of the Scottsdale Wound Management Guide continues the tradition of providing the wound care practitioner basic as well as advanced information about assessing and treating all types of wounds. As I have said before, it is a Guide that should be in every wound care practitioner’s library and/or pocket.” — Terry Treadwell, MD, FACS, the Senior Clinical Editor of WOUNDS. HMP Wound Care Division includes Today’s Wound Clinic; WOUNDS, the most widely read, peer-reviewed journal focusing on wound care and research; Ostomy Wound Management (OWM), the only peer-reviewed, multidisciplinary publication specifically dedicated to the advanced wound care practitioner; and Podiatry Today. HMP has spent the past three decades focusing on advances in the clinical care and treatment of some of the world’s most debilitating diseases and medical conditions. Today, healthcare professionals consider HMP’s medical journals, websites, meetings, and symposia authoritative sources for comprehensive information in the fields of wound care, dermatology, podiatry, cardiovascular care, electrophysiology, long-term care, managed care, diabetes, arthritis, and specialized primary care. HMP’s journals are both peer-reviewed and non-peer-reviewed to best disseminate critical content in the most effective manner for readers. In addition to online and print media, the company produces and manages tradeshows, conferences, symposia, digital programs, and customized programs. HMP is the parent company of wholly-owned subsidiaries HMP and North American Center for Continuing Medical Education, LLC (NACCME), a leading accredited medical education and communications company. Both companies serve the vital needs of the medical community through various business models. Matthew Livingston (1965-2015), BSN, RN, CWOCN. Matthew Livingston was Director of Wound Care and Hyperbaric Medicine at Honor Health, and worked as an industry consultant. He was dedicated to improving the lives of so many people he cared for over the years. Most importantly, he was a loving husband and a wonderful father. Nothing made him happier than time spent with his family. Matt passed away in 2015. He will be greatly missed by the countless people whose lives he touched. Volume 3 of the SWMG will help keep his legacy alive. Dr. Wolvos received 3 degrees from Indiana University (BA, MS, MD). He completed his general surgery residency at St. Elizabeth’s hospital of Boston. He now practices General Surgery, Advanced Wound Care, and Hyperbaric Medicine in Scottsdale, Arizona. Dr. Wolvos has numerous publications and has given hundreds of wound-related presentations both nationally and internationally. He was voted by his peers as “Best of Phoenix in Wound Care” by Phoenix Magazine.